Clothing/Jewelry Description Possibly a bra and a slip. Distinguishing Characteristics Caucasian female. Blonde hair, gray eyes. Moate was last seen at Frenier Beach, near Laplace, Louisiana on November 24, 1956. That morning, a hunter and his son saw a blue four-door sedan parked five yards from the shore of Lake Pontchartrain. A man and woman were in the backseat. They were later identified as Moate and Thomas Hotard. Three hours later, another hunter noticed the same sedan, and saw Hotard in the backseat in a strange position. The hunter did not investigate. The next day, the first two hunters saw the car again in the same place, and this time they went to check on it. Hotard's body was inside the car. He had been shot in the back; someone had pressed a shotgun against the rear window glass and fired. Moate was nowhere to be found and she has never been seen again. On the ground nearby were the partial contents of a woman's purse, and female clothing and shoes were found on the floor of the car. Small footprints, as if from a woman's bare feet, lead from the car into the woods nearby. The prints were spaced far apart, indicating the woman had been running. Along with the bare footprints were the tracks of a man's boots. Five feet away from the car, it appeared as if a struggle had taken place and a set of car keys was found on the ground. The footprints ended at a road leading to the main highway, and a single tire track, possibly from a motorcycle, was located. 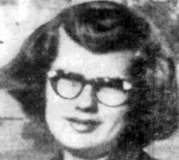 At the time of her disappearance, Moate was divorced and the single parent of three children. She was employed as a buyer at Kaiser in 1956. Hotard's and Moate's families believed the two were only good friends, but in fact they had been having an affair for two years. Hotard was married. After Moate's disappearance, her car was found at the cafe where Hotard had picked her up. The keys found at the scene of Hotard's murder turned out to fit Moate's car's ignition. On December 6, two weeks after Moate's disappearance, her former mother-in-law received a call from someone identifying herself as Moate. The caller said she was in trouble and needed help, then hung up. It has not been confirmed that the caller was Moate, although her mother-in-law believed she was. Moate has never been located and Hotard's killer was never identified. Foul play is suspected in her case due to the circumstances involved. Updated 3 times since October 12, 2004. Last updated September 28, 2018; picture added.